How do cartoonists find markets for their cartoons? This was a recurring question I always asked myself, after seeing the same cartoonists appearing in many different magazines on a recurring basis. When I began submitting cartoons to publications in the mid 70’s, I followed the normal procedure. I subscribed to some well-known publications at the time such as Gag Recap (published out of N.J.) , Cartoon Markets (published out of Minneapolis), Cartoon World (published by George Hartman out of Lincoln, Nebraska) and another one called Toon-In by Paul Swan down in Texas. 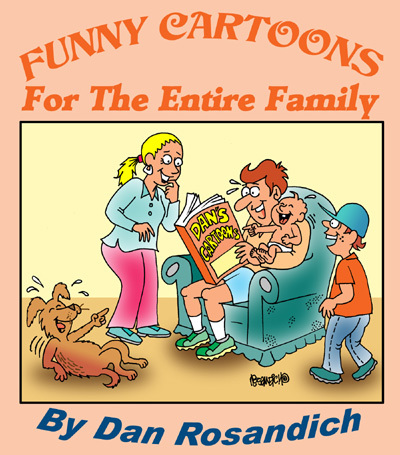 Each newsletter was crammed with cartoonist related gossip, stories and articles on how to draw and set up a good gag for panel cartoons and so on. 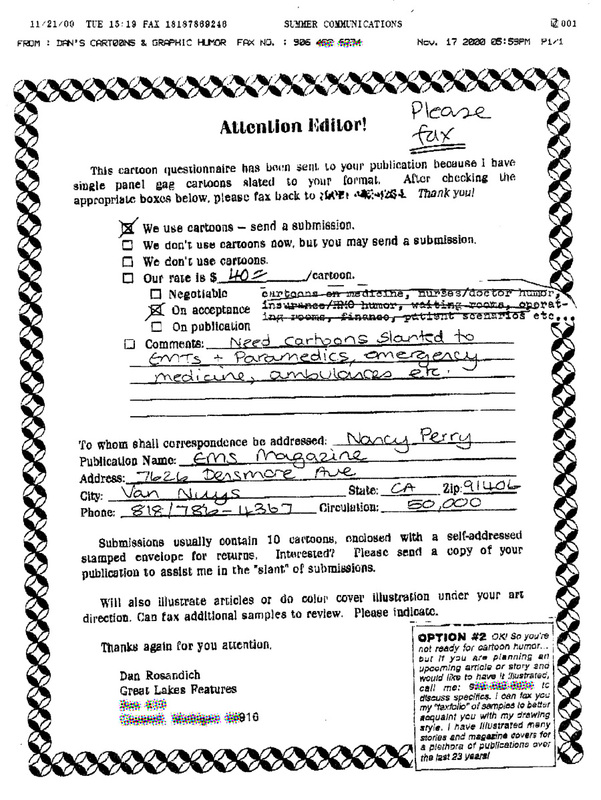 A lot of information was provided regarding new magazines and editors who were looking for single panel gag cartoons. This was at a time when the field was wide open for beginners and newcomers to the business of magazine gag cartooning. A few contributors to the publications were full time cartoonists themselves, which made it all the more intriguing and interesting which provided a great insight into the inner-workings of gag cartooning. They would show samples of cartoons they had published in trade journals and “regional” magazines, those recaps would go on to identify who the person was that edited cartoons and what the publications physical editorial mailing address was. I was still trying to refine a good drawing style and learn about humor, writing cartoon gags and trying to implement other promotional techniques regarding my work but still followed a “herd mentality” of waiting for markets to come my way through these publications. I was in touch with a cartoonist in California who had began archiving her work on the computer and she also began using annual publication directories. These were and still are thick New York City telephone book sized directories that list in depth information on each magazine, newsletter, regional publication, trade journal or newspaper that is currently being published. She told me that I ought to invest in one of these books which cost around $300 to $400 at that time. Mind you, this was before the home computer became a normal part of business, like they are now. The popular technology at the time was the fax machine. We decided to split our efforts in sending out a cartoon questionnaire to a section of the directory I chose and she’d pick out a section and we’d share that information. For anyone who has used marketing and promotional efforts, you will know that if you used direct mail, a response rate of 1% to 3% (3% being phenomenal) is considered the average rate. Upon sending out questionnaires after a period of time, we discovered that we were getting a 6% response rate. It was great, based on the new technology including the “niche” factor. This, plus the fact the directories were very up to date so getting a bad listing was very remote. I think this is why getting a good rate by sending out these fax questionnaires was so good. I increased my submission tactics with this technique and on weekends I could send out this single sheet to roughly 1,000 different newsletters, magazines and trade journal publishers. On weekends, when the phone rates were lower, I would spend time off and on sending this page to magazine and newsletter publishers I would find from the directory and average a number of send-outs on Saturday and also on Sunday I’d do the same. Some of these markets were in Canada, and the Canadian publishers seemed to have an equally good interest in cartoons. Others had no actual room in their magazines since they devoted more space to classified and display advertising so they told me they simply had no room. Those were the days when the publishing market had it’s best days making alot of their incomes from advertising and supplementing it through subscriptions. It wasn’t unusual for niche publishers of investment newsletters to charge subscribers $500 per year for subscribing to their publication. Then consider if they have 5,000 subscribers you can understand how much was being generated by subscriptions alone. I always used a newsletter’s subscription rate as a gauge in helping to formulate a price for my cartoons, among other factors. By Monday morning, the phone would be ringing like crazy and it was a great way to collect my own personal markets. Some which I still have as regular clients. Some email me to assign a “custom” cartoon they need at intervals every other month as opposed to monthly. Now mind you, many of these came back as “no” they don’t use. 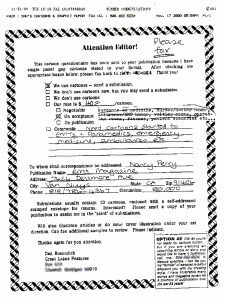 Other publishers never actually faxed the form back, but did send it filled out appropriately, along with sample copies of their publication. Faxing my cartoon roughs could also be done this way! Many did, and after using for a while, they gradually used less and less but those that did not want cartoons, had assigned custom cartoons to use in articles or for stories. As time went on, states began to develop and enforce anti-faxing laws and this technique gradually became obsolete. It was a great way though, to promote my work and sell cartoons that I would otherwise have never been able to do…all of this long before the impact that the internet had on cartooning. If you seek resources for locating publishers that might be interested in your cartoons, search out Cision, which used to be Bacon’s Publishing based out of Chicago. Cision has an information database of magazine publishers and their previous directories (which are no longer published – they are strictly digital) may be of interest to you. There are now many other resources to easily locate contacts if you scour the internet for finding places that might be interested in your cartoons.